International design houses are making a big effort to create sustainable, eco-conscious and socially responsible furniture for homes, offices and public spaces. Using recycled and recyclable materials and collaborating with crafts people using socially responsible methods of production, they are able to offer you great design and keep waste out of the landfill. "Imagine," says Philippe Starck, "a guy takes a humble broom and starts to clean the workshop and with this dust he makes new magic. That's why we call it the Broom Chair." The Broom Chair by Philippe Stark, designed for Emeco, comes in 6 colours and 3 sizes. Philippe Starck and Emeco came together to create a new chair that is reclaimed, re-purposed, and recyclable – and designed to last. The chair is made from 75% waste polypropylene and 15% reclaimed wood that would normally be swept into the trash. Mater - Latin for mother - is a Danish design brand recognized and applauded as a global pioneer in creating sustainable, eco-conscious, socially responsible design. The Mater Recycled Aluminum Stool comes in 3 sizes and is made of recycled aluminum with a black Italian leather seat. Handcrafted in recycled aluminum with a black Italian leather seat, these pieces are crafted in a small Indian workshop. The raw material is from old car components and other aluminum waste that is collected through the program SUSBIZ India, an organization that integrates socially and environmentally responsible business conduct with strategic business development. Each 111 Navy Chair is made with content from approximately 111 recycled plastic bottles. It is available in 6 colours. Coca-Cola and Emeco collaborated to solve an environmental problem: up-cycling consumer waste into a sustainable, timeless, classic chair. Made of 111 recycled PET bottles, the 111 Navy Chair is a story of innovation. The Navy Chair is a successful solution to a problem using environmentally sound structural materials. When you recycle a plastic bottle, you are doing something good. When you recycle 111 of them, you're doing something great! Herman Miller's iconic essential - the Aeron Chair - even if its black, its green! Aeron Chairs are comprised of 56% recycled materials and are 94% recyclable. Designed by Don Chadwick and Bill Stumpf in 1994 for Herman Miller, the Aeron Chair has 3 sizing options and comes in many fabrics and finishes. If you need help choosing what is right for you, please call GR Shop at 1-866-207-1111. Using Aeron Chairs in commercial settings may contribute to LEED credits due to its returnable/reusable packaging, durability, pre-consumer recycled content, and post-consumer content. Depending on location, Aeron also may contribute to a LEED Regional Materials credit. This entry was posted in Seating & Chairs, Green & Eco-Friendly, Office & Workspace, Multi-use Chairs and tagged emeco, emeco navy chair, Eco Friendly, Broom Chair, Mater, Mater Recycled Aluminum Stool, HM Aeron Chair, recycled materials on September 24, 2014 by Christine Toller. Nest – noun - a place or environment that favors the development of something! Are you feeling the urge to feather your nest this Fall? The Knoll Annual Sale is a good place to start. Eero Saarinen's 1957 Womb Chair (and optional Ottoman) is available in 2 sizes and a wide choice of fabrics and leathers - cuddle up! Founded in 1938 and headquartered in the USA, Knoll boasts an extensive portfolio of products ranging from office work systems and residential mid-century modern classics, to textiles and accessories. 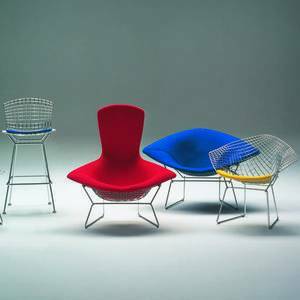 Iconic pieces from classic designers such as Harry Bertoia, Eero Saarinen, Warren Platner, Isamu Noguchi and Florence Knoll make up a large component of Knoll’s collection. Harry Bertoia's Side Chair is available in 8 frame colours and many upholstery options. Warren Platner designed a series of chairs and tables for Knoll in 1966. Each piece is created by welding hundreds of curved, nickel-plated steel rods to circular frames, simultaneously serving as structure and ornament. Beautiful! The 1954 Florence Knoll Lounge Collection is a modern classic you can tailor to your own space by choosing from hundreds of fabrics and finishes. Knoll’s products can be found in private residences and major art museums alike, including 40 products in the permanent collection of the Museum of Modern Art in New York. Browse GR Shop's Knoll Collection and save 15% until September 30th. This entry was posted in Seating & Chairs, Living & Rec Room, Fabrics & Textiles, Kitchen & Dining, Office & Workspace, Sales and Promotions, Multi-use Chairs and tagged knoll sale, florence knoll, knoll furniture, Knoll Annual sale on September 16, 2014 by Christine Toller. Welcome to the Loll Designs September Outdoor Furniture Sale! Made from recycled materials that are maintenance free, weatherproof, and can be stored outdoors year-round, Loll Designs' furniture will bring fun and durability to your outdoor entertaining. Loll Racer Outdoor Lounge Chair and Rocker, available in 7 colours. Loll Designs came into being in 1997 when a Minnesota-based municipal skate park designer/builder, TrueRide, designed, built, and installed more than 450 custom skateboard parks in cities across the U.S. and abroad. TrueRide’s founders, fueled by an inherent concern for the environment, looked for a use for the recyclable materials in their skate park projects. In 2003 Loll Designs was conceived as a way to re-purpose excess skate ramp material into outdoor furniture. The iconic Adirondack chair was a natural place to start and it was launched in 2006. Loll 4-Slat Adirondack Chair comes in a choice of compact, standard and tall sizes. 10 fun colour choices available. It is also available as a rocker. The thin profile of the recycled plastic gives this chair a refined modern quality and nearly every stainless fastener is hidden. The contoured seat and back are so comfortable there is no need for a cushion. The Loll Pitch Outdoor Birdhouse comes in 3 styles for modern avian living, with easy mounting and easy access for cleaning out the old nest. 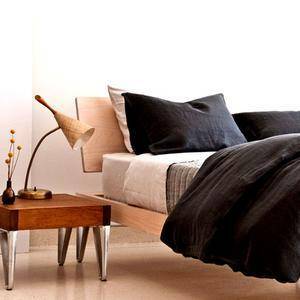 With a focus on modern design and doing the right thing, Loll Designs forged ahead creating hundreds of products. Unique recycled materials and sustainable business practices all coalesce to make innovative, functional, and thoughtful products made in the USA and distributed worldwide. See all Loll Designs at GR Shop. This entry was posted in Seating & Chairs, Accents & Accessories, Green & Eco-Friendly, Garden & Outdoor and tagged modern outdoor furniture, recycle, sustainable, Loll Designs, recycled on September 1, 2014 by Christine Toller.